Career as a player – In football, he started with San Gwann FC Nursery till the age of 18 years. He played in the first and second division with San Gwann FC. Following that, Clayton went on loan with Msida St.Joseph FC and following a bad injury, he had to stop playing for 3 years. 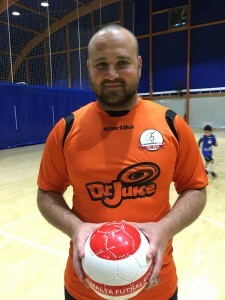 Following his return from a long-term injury, Clayton started playing futsal for San Gwann FC and consequently Valletta Futsal, winning the first division championship with both clubs. Career in coaching – Clayton started coaching with Ta Zwejt Boys Futsal Club in the local fourth division and then coached San Gwann Fc in the top division. Following the initial stages of his coaching career, Valletta Futsal Club engaged in his services for 3 consecutive seasons. With Valletta Futsal, Clayton won the league once and coached them in the Uefa Futsal Cup in 2016. During the past two seasons and the current season, Clayton is a youth football coach with San Gwann Fc. Qualifications - Clayton has obtained the following coaching qualifications: Coaching Young Footballers Certificate and the Basic Futsal Diploma.